Any salad of your choice. 1. Cut the tip of the two oranges as shown in the picture. Save the pieces for ears. 2. Take one orange and carve the eyes and nose and make two slits on the top to fix the ears. 5. From the third orange carve out the hands and fix them with tooth picks.Also cut a base to make the Teddy stand and fix with tooth picks. 6. Make any salad of your choice and place the Orange Teddy in the center. It is just a simple carving but makes the table decorative. Such a cute decoration , Perfect for aparty table for a child. Create n carve is being hosted at simply food, would love to see you send this in for the event. that's a really cute decoration. Wonderful idea for a kids party. Such a cute table decoration. Kids will like it. 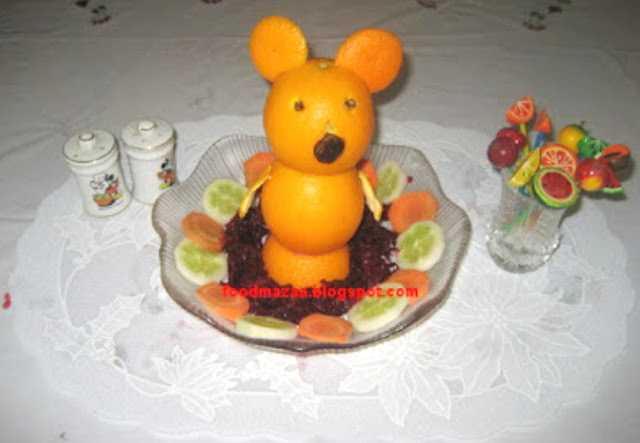 I love the step by step instructions for this adorable fruit carving.